Donald Glover aka Childish Gambino performs onstage at Which Stage during Day 3 of the 2015 Bonnaroo Music And Arts Festival on June 13, 2015 in Manchester, Tenn.
Childish Gambino is heading out on the road with Vince Staples for his This Is America tour starting in October, and he has a special gift for his fans in celebration. 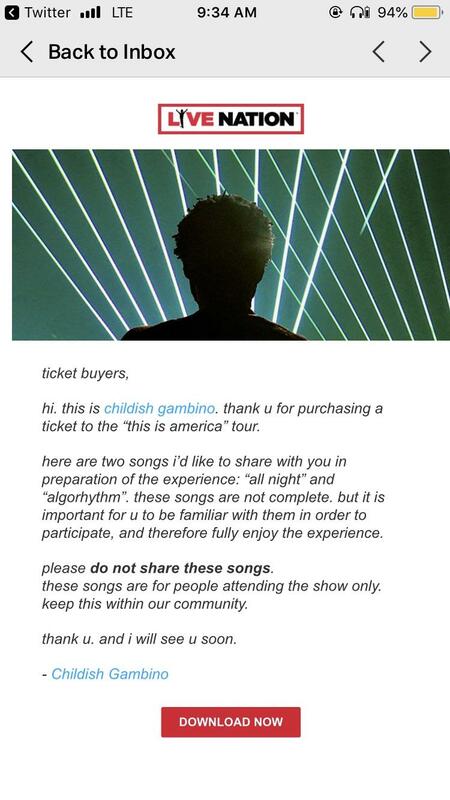 Fans who purchase tickets to a show are receiving two songs from the singer, "Algorhythm” and “All Night.” “These songs are not complete,” he reportedly wrote according to a screenshot posted to Reddit. “but it is important for u to be familiar with them in order to participate, and therefore fully enjoy the experience.” He also asked fans not to share the songs, as they are exclusively for the live show.